Used by Robo Knight from the Megaforce TV show. This morpher includes sound action. Includes 1 Power Ranger card. Be just like the Power Rangers with the Ranger Battle Gear! 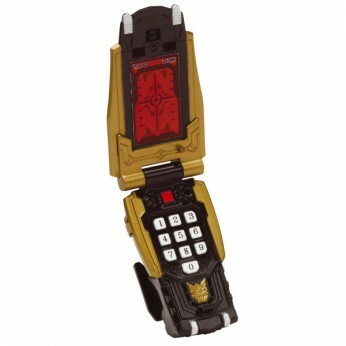 The Robo Knight Morpher has light and sound features and allows cards to be inserted. One supplied; Size H18, W5.5, D5cm; Batteries required: 2 x button cell (included). For ages 4 years and over; EAN: 3296580350391. WARNING(S): Not suitable for children under 3 years old. Only for domestic use. * . 1 Question 1 Answer Become the Robo Knight Power Ranger with his incredible Megaforce Robo Morpher. Unleash Robo Knight’s ultimate attacks with the press of a button! The Robo Morpher features realistic battle sounds and measures 18cm tall when open. This awesome toy, for children aged four and up, includes the 2 x LR44 batteries it needs. One Power Card is included. This toy costs approximately £15.99 (for the latest and best prices make sure you check our retailer list for the Power Rangers Megaforce Robo Knight Morpher above). In our review of Power Rangers Megaforce Robo Knight Morpher we classed it as being suitable for ages 3 years, 4 years, 5 years but recommend you check the manufacturer specific advice before purchasing.